Think of Syrian modernists and most likely, you will think of a man: Fateh Moudarres, Mahmoud Hamad, Louay Kayyali. In fact, most of the regional modernists in the history books are male, which is one of the reasons why the pop-up exhibition from Dubai-based Atassi Foundation is so refreshing. Personal Revolutions is a show curated by women revealing the depth of female creativity across almost a century of practice and offers a window into an unknown side of art from Syria. The exhibition begins with a 95 year-old tapestry, created by students of the Al Sanae’ School for Girls (a school that was founded in Aleppo in the early 20th century by Fa’eqa Moudarress to teach daughters of martyrs craftwork like embroidery) and the exhibition pays tribute to the rich tradition of female craftwork. It also includes intimate portraits painted by modernist females, in some cases, the wives of the more well-known painters of the time such as Dorreih Fakhoury Hammad, who travelled with her husband to Europe and practiced her own art alongside him. Against a backdrop of deep social and political change, this exhibition pays tribute to the creativity of Syrian women right up to the present day. 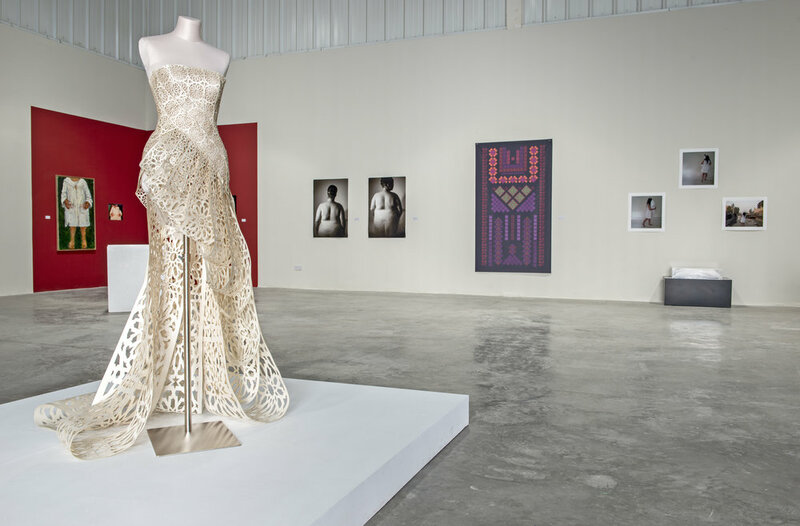 One of the highlight’s is Sulafa Hijazi’s Dress made of 372 QR codes that together form a decorative mosaic similar to those seen in traditional embroidery styles of the Levant, in particular those of Palestine. Each QR code links back to discontinued links on the internet asking the question can a ‘digital dress’ fade in the same way as a material dress. Hiba Ansari’s Mathematics Book reflects upon the senseless destruction of war and the casualties lost within it. Fashioned upon an old maths book discovered in a bombed out house, the book is as lifeless as its once owner, its numbers and equations as baffling and irrational as the war itself, a testament to the tragedy of systematic destruction. Still from Randa Maddah’s In View . Courtesy of the artist and the Atassi Foundation. Another piece that resonated was Randa Maddah’s In View – a video work shot from the rooftops of the artist’s house in Majdal Shams in the Golan Heights (occupied territory). 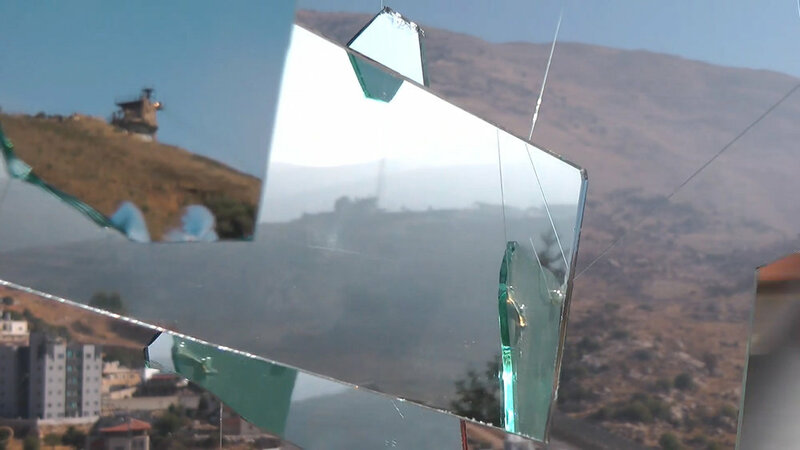 By using suspended pieces of broken mirrors, Maddah brings both Israeli and Syrian military installations into the same line of sight. In doing so, she reminds us that people on both sides of the border are subject to the same oppression and underlines the human cost of war.